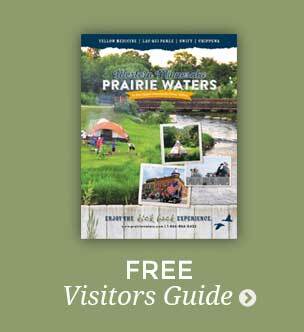 Dawson, a community rich in Scandinavian heritage, is in the heart of Prairie Waters farmland. Whimsically known as “Gnometown USA,” you’ll find gnome statues located at the City Park along Highway 212 and at homes throughout the town. These gnomes are created by a local artist in honor of various members of the community. During Riverfest, held the last weekend in June, a new gnome is unveiled. The annual celebration also includes softball tournaments, music, food and fireworks. The Lac qui Parle River flows through Dawson, creating a beautiful setting for the new riverside walking/biking trail. Dawson offers a great range of activities, including a 9-hole golf course and a disc golf course, a new beautiful outdoo r swimming pool, relaxing parks, volleyball, tennis and basketball courts, softball complex, picnic shelters and a playground. A ten-site campground with electrical hook-ups and water service is available near the swimming pool park. Unique shops and restaurants make a visit to Dawson worthwhile! The City has three parks, o ne is located off Hwy 212 by the new outdoor swimming pool, another is located close to downtown right off 6th Street, and the third is the Veteran’s Memorial Park south of the river. The Riverside Park has a shelterhouse, playground equipment and horseshoes. The swimming pool park offers playground equipment, volleyball court, tennis courts, basketball courts and shelterhouses. The Veteran’s Memorial Park offers a quiet, scenic camping and picnic area along with a beautiful walking trail which is approximately one mile long. During the summer months a Farmer’s Market is open at Veterans Park each Thursday from 4 p.m. to 6 p.m. Displayed at the swimming pool park are all the gnomes celebrating outstanding citizens from the community of Dawson. A kiosk is also located there with information in regards to each individual gnome. Don’t miss Memorial Auditorium for quality arts performances! Since 2001 the Dawson-Boyd Arts Association has offered events at Memorial Auditorium from September to June each year. A wide variety of entertainment includes classical, folk, chamber and popular music, plus children’s theater, dance and comedy. The tenth celebration season offers something for everyone: 34th Infantry Division Red Bull Band, Minnesota Orchestra, American English – Beatles Tribute Band, comedy and juggling by The Danger Committee, jazz vocalist Prudence Johnson, vocal duo Neal and Leandra and much more! Dawson cherishes its historic buildings! The Commercial Bank Building, Dawson Armory and Community Building, and the Carnegie Library are all listed on the National Register of Historic Places. In 1892 the brick Richardsonian Romanesque bank was built with a beautiful granite trim. The bank was built for Dawson’s founder Christopher M. Anderson. In 1923 brick National Guard armory and public recreation center was built, and now contains a public library and senior housing. In 1918 the brick Classical Revival Carnegie library was built. 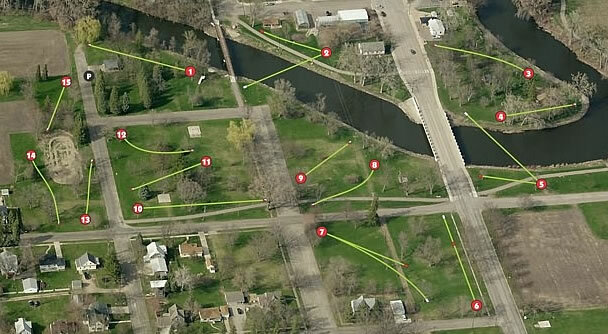 Rent out a set of discs for free or bring your own and enjoy a beautiful 15 basket disc golf course along the river! We celebrate the culture, history and the community of Dawson. Events include Friday evening Fireworks, Softball Tournaments, Sunday afternoon parade, Saturday Craft/Flee Market, annual golf tournament, fitness runs, and the unveiling of the annual Honorary Gnome. There is a wide variety of events throughout the town for young and old alike all through the weekend. Whether you like to shop, compete, eat, or enjoy the friendly rural community fellowship, Dawson Riverfest is an event for you. For more information contact the Dawson Chamber of Commerce.